this time, it looks reasonable to me. This is troubling us since for 5 samples, the old version (V1.6-7) seems working fine, whereas the new version (V2.1-13) seems having issue or can not get further filtering by VQSR (90, 99 and 100 got the same result, I did repeat multiple times and got the same results), although for all of the 17 samples, the new version seems fine on VQSR. 1. is it possible that in some occasion, VQSR can simply not work? 2. Why the old version seems working but not the new version for exactly the same set of 5-sample data? So my question is: why the option of dcov in UG step (although I used what was suggested by both old and new version documentations) has such big impact on the VQSR later disregard of whether it is old or new version I am running? Thanks a lot for any insights! There seems to be a lot of details here. Can you please post the full command lines that you are using to help us understand what you are seeing. However, for the same set of 5 samples, for UG step like above command, I just use -dcov 50 instead of -dcov 200, then I got the reasonable tranches file shown above (in my 2nd post). Is it odd? Did I do something wrong here? Is this by any chance a targeted exome or smaller project? We don't recommend using the VQSR on such projects with small numbers of samples. My guess is that the fluctuations you are seeing don't have anything to do with the downsampling in the UG but are rather a sign of numerical instability in the VQSR with small numbers of variants. Take a look at our best practice recommendations for advice on how you might be able to use the VQSR with your project. yes, it is a small project but as whole exome seq (the bed file is the whole exome target regions from agilent) with just a family of individuals with some of them with a type of cancer suspected to be inheritance-related or genetic cause. 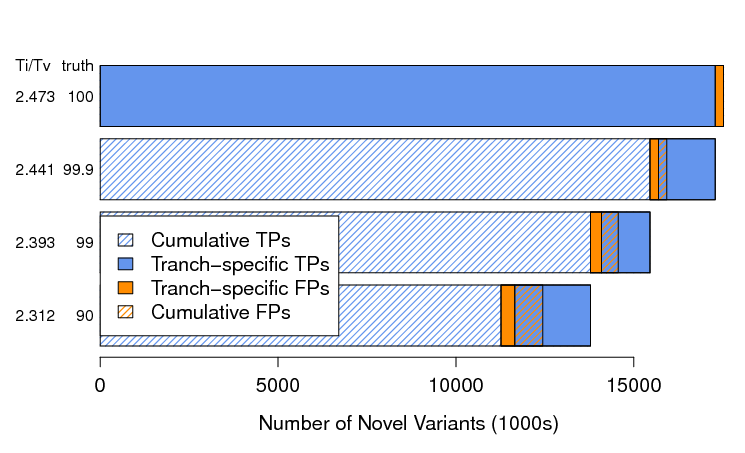 I double check the documentation of VQSR, which emphasize on the number of variant sites in the callsets at range of thousands of variants (except for using InbreedingCoeff needs at least 10 samples), and my dataset does have about 50k variants after UG for only 5 samples ( a subset of the family with Trio relations) and 70 k for all members of the big family (17), so I though it is reasonable to use VQSR, does it? I did on just 5 of them is because these 5 samples are with trio relation, we just want to see any improvement of the calls. I did do the variant calls and VQSR on all 17 samples of the whole family as well. which looks fine. So even if I have 50k variants in the 5-sample callset, the number of samples as 5 still not good enough? I just wonder why even for 5 sample callset, after using -docv 50 on UG step, and it seems now that VQSR has the separation for 0.90 and 0.99 thresholds as mentioned above, compared to if use -dcov 200? did not realize that --maxGaussians has such great impact on this. What do you think? The idea is that the lowest tranche is highly specific but less sensitive (there are very few false positives but potentially many false negatives, i.e. missing calls), and each subsequent tranche in turn introduces additional true positive calls along with a growing number of false positive calls. My plots appear to be behaving in the opposite manner, or maybe I'm just misunderstanding what is meant by "the lowest tranche"? I'm working in a non-human organism, so I bootstrapped by very stringent filtering of an initial call set (3.8M input training SNPs - 18 samples = WGS) with GATK 2.5-2-gf57256b and fed it into VQSR with the raw VCF. Any help (correctly) interpreting these plots would be much appreciated!!! Hi there, sorry for the delayed response. No worries about the bug, though you almost got banned by the automatic spam filter. I can't find your plots on the ftp, are you sure they uploaded successfully? You can attach them to a forum comment too, btw, which may be simpler. 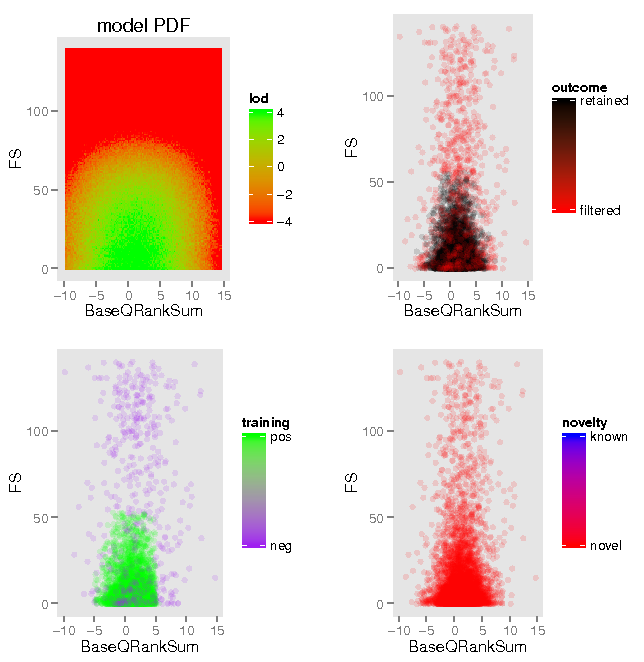 Attached is the --rscript_file and the tranches plots for GATK v2.5 and v2.6, respectively. The ti/tv values for the tranches are quite a bit different for the two versions which is surprising. Can you post the log output for the two runs of VariantRecalibrator? There is a lot of interesting info in there that will help us debug. 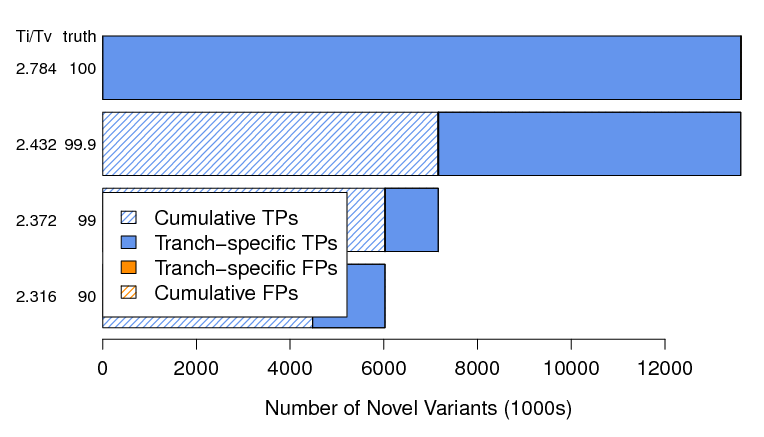 INFO  23:08:30,001 VariantDataManager - Training with 3856585 variants after standard deviation thresholding. INFO  23:13:01,766 VariantRecalibratorEngine - Finished iteration 0. INFO  00:34:42,515 VariantRecalibratorEngine - Convergence after 72 iterations! INFO  00:37:07,046 VariantDataManager - Found 0 variants overlapping bad sites training tracks. INFO  00:38:00,059 VariantDataManager - Additionally training with worst 3.000% of passing data --> 524550 variants with LOD <= -33.4560. INFO  00:39:18,063 VariantRecalibratorEngine - Finished iteration 0. INFO  00:50:38,529 VariantRecalibratorEngine - Convergence after 56 iterations! INFO 18:38:46,407 VariantRecalibratorEngine - Convergence after 54 iterations! Any idea why I got such error in SNP VQSR but not in Indel VQSR? In Indel, I used --maxGaussians 4. but in SNP, I used -nt 4 based on documnetation, other than the -resource files from bundle, these are only difference between the indel and SNP VQSR. 2) files are labeled with true or false indicating the state that the known attribute was set to at the --resource flag. Just follow up on my last post, for SNP VQSR, I found out that the error was caused by the absence of --maxGaussians 4, as long as I added the option: --maxGaussians 4, with or without -nt 4, they all went through well. Not sure what default value for --maxGaussians. With -h , I can not see it. any way, any idea why it behaved like this? @bredeson, thanks for the files. Due to the holiday we may not be able to get to this for a couple of days though. Thanks for your patience. 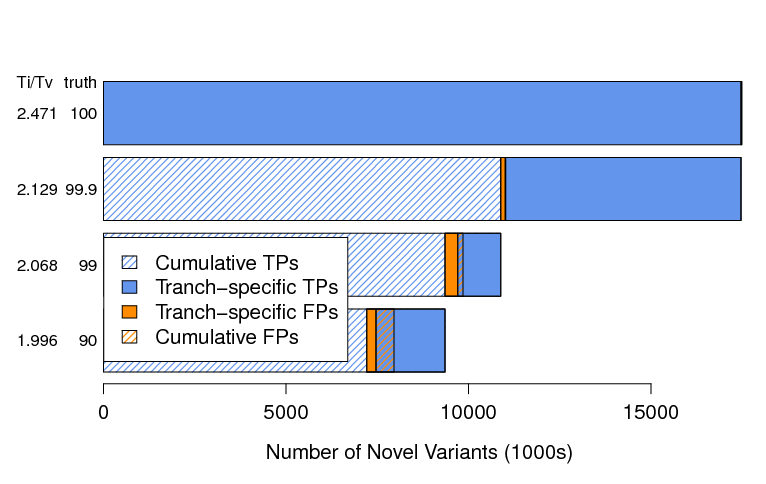 I think one source of the confusion with TP/FPs on the tranche plot is that in the 2.6 plot all of the tranches are over the specified target ti/tv value and so there is no way to estimate TP/FPs (everything is assumed to be a TP) but in the 2.5 plot you have ti/tv that go above and below the target ti/tv value. Is this data from an exome sequencing project? If so you probably want to increases that target ti/tv and I think the tranche plots will make more sense. Take a look at the --target_titv argument in VariantRecalibrator. 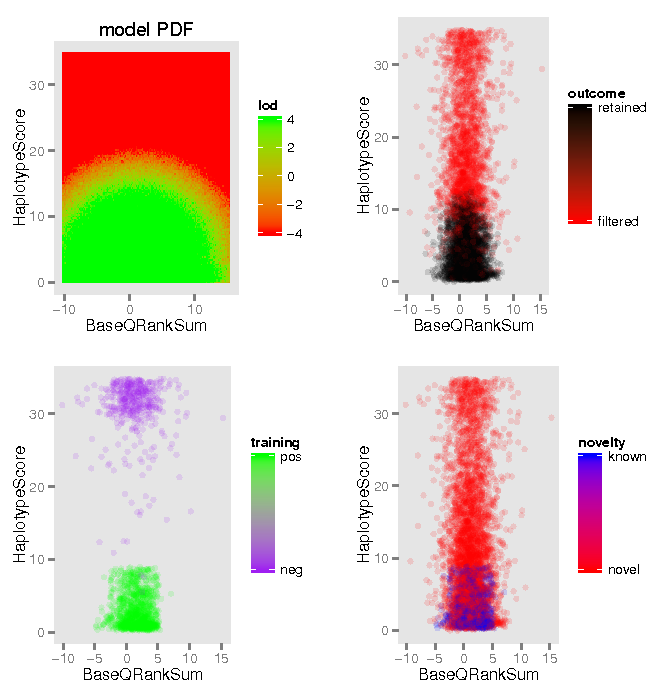 I realigned around indels (which I thought I had done with the prior dataset) and then re-called (with UG) and re-ran VQSR with a --target_titv of 2.5 and the following plots were outputted. This result, as before, still contains tranches with cumulative [TF]Ps in the starting tranche, and it is still not clear to me how that is possible: is this an artifact of my training data (stringently filtered sites from the same dataset) or of the way I ran VariantRecalibrator (see log below)? @rpoplin: To answer your previous question, this is WGS data. Hi I have analyzed 2000 exome samples using GATK 3.2.2 and I have ended up with a huge around 700gb VCF file after VQSR. My tranch plot looks really bad (attached file) and the ti/tv ratio is really low. I did not use the interval list (-L) during my analysis . Now, can I use the interval list and exclude those variants outside the intervals after the VQSR ?? or do I have to run all the steps again ?? Please let me know. Thank you in advance. Just checked that the vcf file has got 29513599 SNPs that passed the VQSR to let you know. @dheeraj You can re-run just the VQSR steps, this time using the -L intervals. This will eliminate the variants that are outside your target regions. Also, you can specify the expected titv argument to match your expectation for exome, which is different from whole genome.